Arriving just in time For Halloween we have Disney’s Mickey Mouse Clubhouse: Mickey's Monster Musical releasing on DVD September 8th! Put on your favorite Halloween costume and get set for a spooktacular full-length adventure. Then, enjoy two more exciting episodes as you search for pirate treasure with Captain Mickey and don your dungarees for delightful fun down on the farm. 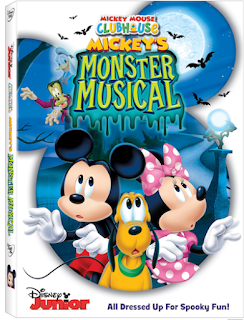 The DVD includes nearly 2-hours of adventure plus an Exclusive Trick-Or-Treat Mini Tote!